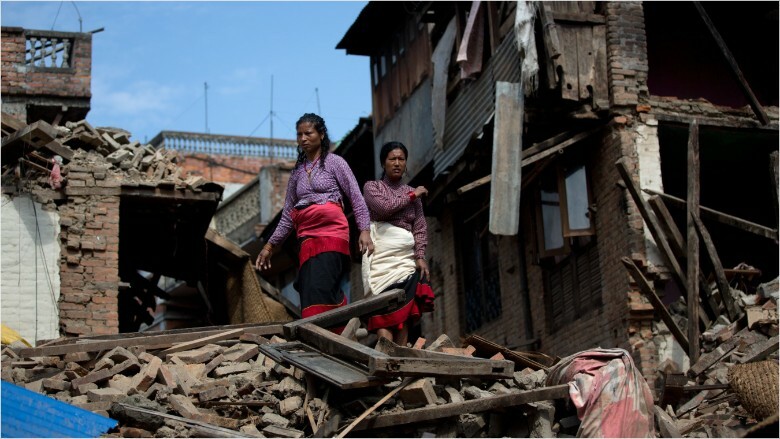 Women walk through the rubble of houses damaged by the deadly earthquake in Nepal. Nepal is on track to receive the most foreign aid in its history. But even as the international community pledges money and support in the wake of the country's deadly earthquake, it still isn't expected to be enough to get the country back on solid footing. So far, over $60 million has been pledged to help Nepal, based on the latest data compiled by CNNMoney. But the earthquake's total economic cost is expected to reach well into the billions, based on early estimates from the U.S. Geological Survey and IHS. IHS economist Rajiv Biswas forecasts it will cost over $5 billion to rebuild Nepal. His estimate doesn't include the immediate costs for rescue and relief. While international aid generally surges in the immediate aftermath of natural disasters, the totals at year-end tend to remain below the $1 billion mark for any given country, based on data from the Organisation for Economic Co-operation and Development (OECD). In Haiti, aid poured in -- totaling $1.9 billion -- following a monstrous 2010 earthquake that claimed more than 230,000 lives. But humanitarian experts maintain that Haiti was an exception, not the rule. "The money (for Nepal) may not spike in the same way that it did for Haiti," said Jason Nickerson, an Ottawa-based clinical scientist who has worked in humanitarian emergencies in Haiti, Sudan and Afghanistan. Aid after natural disasters can often quintuple compared to previous years, as it did following the Philippines typhoon in 2013 and the Myanmar cyclone in 2008. So far, Nepal is still woefully short of the billions it may need to rebuild. But it is still too early to assess how much help Nepal will ultimately receive from the international community, said Brendan Paddy, head of communications at the U.K.-based Disasters Emergency Committee, which has been raising money for these types of emergencies for decades. Many fundraisers are only just getting started now. Paddy predicts Nepal should receive an outpouring of support because people tend to favor donating to these types of punishing natural disasters. "Earthquakes are one of those types of disasters that raise more money than others," he said. "And it seems to be because they're so shocking and sudden and they produce the most appalling pictures of devastation and human suffering."